High Avenue shelter actually fronts Paramount Avenue, leaving some concerned about the effects of a shelter next door. (Leah Hogsten | The Salt Lake Tribune) Salt Lake City community leaders and service providers hosted a public forum, Tuesday, September 26, 2017 to present preliminary designs and programming for the two new Homeless Resource Centers to be located at 131 E 700 S and 275 W High Ave. in Salt Lake City. 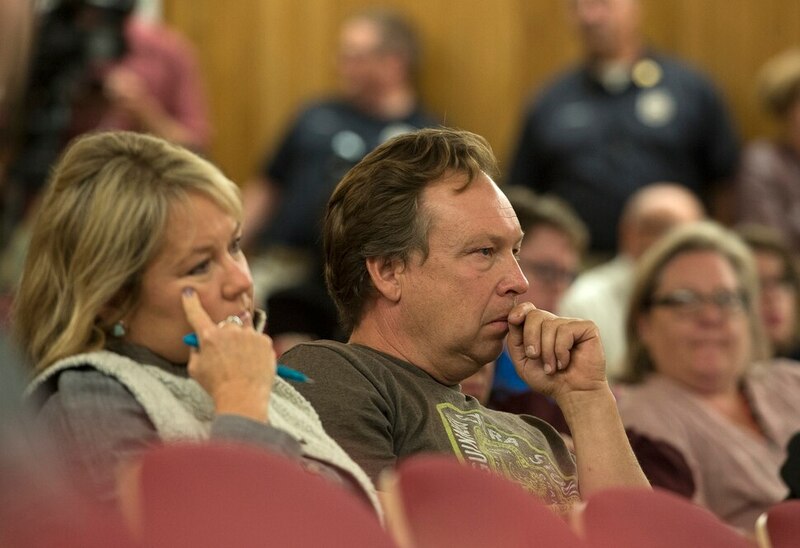 (Leah Hogsten | The Salt Lake Tribune) We're having a hard time releasing the buildings, said Meg and Rick Osguthorpe, who claim they have lost tenants at the two industrial business buildings they own on Paramount Ave after their tenants found out that a Homeless Resource Center was going to be located in that neighborhood. Salt Lake City community leaders and service providers hosted a public forum, Tuesday, September 26, 2017 to present preliminary designs and programming for the two new Homeless Resource Centers to be located at 131 E 700 S and 275 W High Ave. in Salt Lake City. 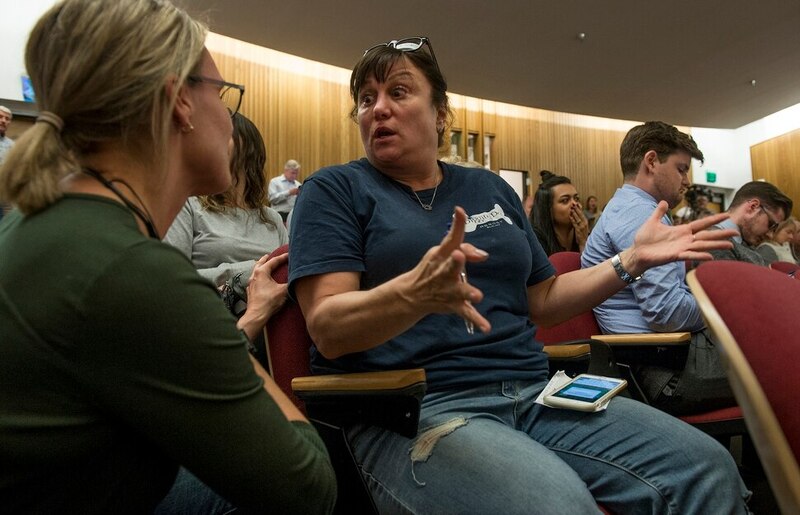 (Leah Hogsten | The Salt Lake Tribune) Michelle Goldberg (right) expresses her disbelief to neighbor Jennifer Luft during the public hearing that the Homeless Resource Center located at 275 W High Ave. would be located right across from her dog daycare business. Salt Lake City community leaders and service providers hosted a public forum, Tuesday, September 26, 2017 to present preliminary designs and programming for the two new Homeless Resource Centers to be located at 131 E 700 S and 275 W High Ave. in Salt Lake City. (Leah Hogsten | The Salt Lake Tribune) Salt Lake City community leaders and service providers, including Kathy Bray, President and CEO of Volunteers of America, Andrew Johnston, Salt Lake City council member, Mike Brown, Salt Lake City Police Chief and Jackie Biskupski, Mayor of Salt Lake City, hosted a public forum, Tuesday, September 26, 2017 to present preliminary designs and programming for the two new Homeless Resource Centers to be located at 131 E 700 S and 275 W High Ave. in Salt Lake City. (Leah Hogsten | The Salt Lake Tribune) Salt Lake City community leaders and service providers hosted a public forum, Tuesday, September 26, 2017 to present preliminary designs and programming for the two new Homeless Resource Centers to be located at 131 E 700 S and 275 W High Ave. in Salt Lake City. (Leah Hogsten | The Salt Lake Tribune) How much input will people experiencing homelessness have with how the shelters are operated? asked David Holland, right, writing his question to be answered by city leaders. Salt Lake City community leaders and service providers hosted a public forum, Tuesday, September 26, 2017 to present preliminary designs and programming for the two new Homeless Resource Centers to be located at 131 E 700 S and 275 W High Ave. in Salt Lake City. (Leah Hogsten | The Salt Lake Tribune) Jill Jones, principal architect with AJC Architects, talks about the design of the two new Homeless Resource Centers to be located at 131 E 700 S and 275 W High Ave. in Salt Lake City. Salt Lake City community leaders and service providers hosted a public forum, Tuesday, September 26, 2017 to present preliminary designs and programming. (Leah Hogsten | The Salt Lake Tribune) Salt Lake City police officers tack questions written by the public for Salt Lake City community leaders and service providers to answer during a public forum, Tuesday, September 26, 2017 to present preliminary designs and programming for the two new Homeless Resource Centers to be located at 131 E 700 S and 275 W High Ave. in Salt Lake City. (Leah Hogsten | The Salt Lake Tribune) Salt Lake City community leaders and service providers hosted a public forum, Tuesday, September 26, 2017 to present preliminary designs and programming for the two new Homeless Resource Centers to be located at 131 E 700 S and 275 W High Ave. in Salt Lake City. Two new homeless shelters inched closer to life with Tuesday’s release of preliminary design concepts — though not without shades of the contentious debate that roiled Salt Lake City neighborhoods when the sites were selected nine months ago. Drawings from Salt Lake City-based ajc architects show two-level shelters, or “resource centers,” that include 200 beds and spaces for housing, medical and legal services, as well as courtyards, kitchens, barbers and kennels. Homeless service clients need not leave the shelter during the day, nor trek across town to receive health care, nor be targeted by predatory drug dealers. But the biggest revelation for a few affected residents was the orientation of the 275 W. High Ave. shelter, which might now more accurately be called the 242 W. Paramount Ave. shelter. Less than one-tenth of the shelter’s 3-acre footprint fronts Paramount Avenue — the next street over to the south of High Avenue — but in ajc architects’ proposal, the small parcel would include a short walkway to the shelter’s client entry. The street’s business owners had reckoned on having a shelter nearby, not next door. “I could have had the courtesy of notice, so that I couldn’t keep pouring money into the building that I own,” a tearful Michelle Goldberg told officials after the shelter designs were presented in a Tuesday-night panel discussion at The Leonardo. “I’m planning on losing my business, to be honest,” said Goldberg, who owns Diggity Dog day care, boarding and grooming across the street to the south of 242 W. Paramount. It’s an industry best practice to have a south-facing entry, said ajc Principal Architect Jill Jones, and the orientation will also ensure more sunlight reaches a secured courtyard at the south side of the facility. 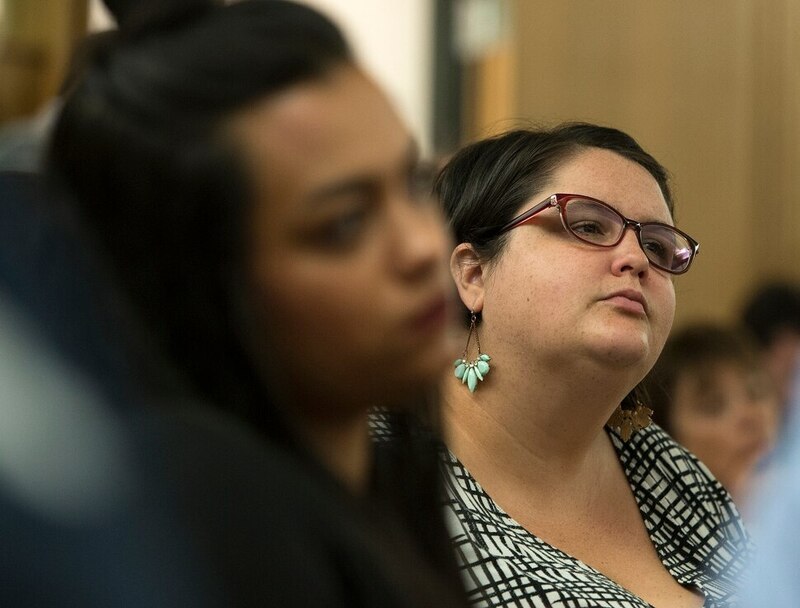 Jones said the city sent a letter to business owners three weeks ago, and she recently met with four business owners to explain how the smaller all-day shelters will differ from the notorious environment they might associate with a 1,100-bed shelter at 210 S. Rio Grande St. But Goldberg said she learned about the Paramount Ave. entryway when she was contacted by a reporter earlier Tuesday. Unknowingly, she had applied just last week for a permit to build an extension to her business. He’s since had three business owners tell him they would have leased the building if not for the shelter, he said. Osguthorpe said he should be compensated somehow for the depreciation of a property that he has been counting upon to sustain him through retirement. That aside, he conceded, “it’s a great place for a homeless shelter” because it impacts so few business owners and residents. (Courtesy of Shelter the Homeless) An early design concept, produced by Salt Lake City-based ajc architects, for a new homeless shelter at 275 W. High Ave. that will serve a combination of men and women. The south-facing orientation also came as a surprise to Salt Lake City Councilwoman Erin Mendenhall, who said it was never discussed during site selection. Mendenhall had been concerned that the Enclave at 1400 South apartments — which include affordable housing for large families — would overlook a north-end courtyard and entry. Instead, she says, business owners to the south will be impacted. “I do wish that in the property evaluation that took place during site selection, that the potential for orientation toward Paramount would have been explained, and it was not, in any shape or form,” she said. Officials and architects refer to the new shelters as “resource centers,” which would differentiate themselves from more traditional shelters. Clients would not be turned out for the day. They would have storage in the facility. Case managers and service providers would have offices and meeting rooms, and exam rooms would be provided for the Fourth Street Clinic to offer mobile services. The shelter at 275 W. High Ave. is gender-segregated, with concepts showing 160 beds for men on the ground level and an additional 40 beds for women upstairs, while the shelter at 131 E. 700 South is for women alone and would sleep all 200 on the ground level. (Courtesy of Shelter the Homeless) An early design concept, produced by Salt Lake City-based ajc architects, for a new homeless shelter at 131 E. 700 South that will serve women. Concepts were not presented for a third, men-only shelter at 3380 S. 1000 West in South Salt Lake that is also being designed by ajc architects. Jones said they have been prepared and that she planned to meet Wednesday with South Salt Lake Mayor Cherie Wood. The nonprofit board that owns the new shelters, as well as two current shelters in Salt Lake City and Midvale, voted in June to select ajc architects at the urging of Salt Lake City Mayor Jackie Biskupski. Developer Kem Gardner said he had persuaded ajc to lower its bid by $800,000 to an undisclosed amount, and the nonprofit’s board was impressed that ajc architects planned to consult with Portland’s Dave Otte, of Holst Architecture. Jones said she had expressed an early interest in designing the shelters, having built facilities for the YWCA and Volunteers of America. The early design concepts have been informed by a committee of more than 85 people, as well as nationally renowned homelessness consultant Ian De Jong. But the design process is in its early stages, Jones said. “These early concepts became available to our working group last Friday. That’s how fresh off the board they are,” she said. “We’re probably at 15, 20 percent at the most” through the process. The shelters need to open by July 2019 if elected officials are to meet their deadline of closing the 1,100-bed shelter at 210 S. Rio Grande St. — thought to be too large and too exposed to area criminal activity, as well as an impediment to development at the western edge of downtown. A request for proposal posted by Salt Lake City earlier this year, before it was known for certain that Shelter the Homeless would become the eventual owner of the new shelters, said the estimated construction cost for each shelter would be about $10 million. Legislators approved putting $27 million toward the effort in February on the assumption that the total cost for three new shelters — including land purchases (which added up to $8.4 million) and design — would be about $40 million. Three open house events will be held Wednesday and Thursday. Open house No. 3 • From 4 p.m. to 6 p.m. Thursday at 275 W. High Ave.